Decided to go out and prospect another new shallow water kingfish spot yesterday, weather was set to be perfect so the goal was to try and catch the wife a monster shallow water king. Got out early and found some good schools of kawahai and had some fun loading up the tank with some ''treats'' for the kingies. Headed over to our new spot anchored up and got the burley running set out two nice livies under balloons as only in 6.5m over water. After a couple of hours one of the livies started getting a bit nervous and sure enough we could see a big green back shadowing the bait, with the excitement levels rising we were ready for what was an amazing strike, the kingfish was locked onto the kawahai and at one point we could see the kawahai clear leaping out of the water with the kingi going nuts behind, after some big splashes and wakes of water we were on and the wife was hanging on for dear life as this green back took off like a freight train!! It was well hooked with a bkk circle hook and I was just laughing seeing the wife in pain getting railed by this fish, doing well though and after about 10mins of line going in and then out we got it close to the boat and I could see it was of fair size and was definitely going to be a PB, so the nerves increased as I wanted to see it landed for Emma's sake. Knots and hook held up (whew! as I wouldn't of heard the end of that one!) And we got her onto the boat high fives all round and and she hit 20.5kg bigger than her last PB of 17kg job done and extremely satisfied we put the monster back to fight another day. Not to miss out we fished a bit longer and i managed to catch another great fish going 12kg which came home to the smoker, another great prospected spot that hit the mark. Who needs snapper fishing when you can have fun slamming kingies all summer long!! Liked!! Well done, great when plans come together like that. Were you fishing over sand or foal. That's a great effort, I presume you were anchored the whole time or did you lead it away in the end. I'll be cheeky and point out it was most definitely a 'horse' of a fish! Great report, patience paid off - i can feel the tension at the end, praying nothing would go wrong. Well done to you and your wife. Satisfying to read. You had a plan,spied out the land ,put plan into action and achieved top result. Well done. As for wives getting the best fish,well,i know that to be true from experience. They are good at that. . Thanks guys I was just stoked to see a monster fish come on board and then great to see it swim away. Awesome mate. Nice to see the wives out there doing it, and showing up us lads. Awesome! Great to see Chicks enjoying the big fishing too! Only 20??? I grabbed a 17 couple of weeks ago that was way skinny looked half as good as that!. Did you get it on scales? true....looks more like 25 from here.......good condition too. It was weighed and put back, was actually quite a short fat fish, caught a 25kg fish back in November prospecting another new spot and that was definitely bigger. 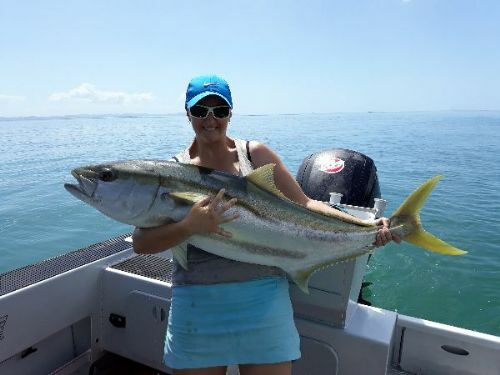 I'm sure she was hoping it was a 25'er but impressive catch all the same!